For years our dentist scheduled us during "quiet time" (so only we were in there) because she was worried that oscar and ruby would frighten the other patients with their screaming. Oscar has finally outgrown QT (thanks to years of modeling by Abe, and laughing gas when they need to do anything serious). Ruby though is still a struggle. I feel like a walking circus whenever I am in that office and the dentist always feels compelled to give me a hug because it's clear I am in over my head. I frigging hate the dentist and I have a confession....I sometimes schedule the kids' appointments when I know I'll have to work so Grammy or Grampa has to take them; does that make me a bad person? Thanks for the story -- haven't been to the dentist with Amelia yet and it's not one I'm looking forward to! Sounds like you're onto something in booking family appts. Now the kids can eat their plum pudding with confidence! It is PURPLE after all! We (meaning the 3 kids) have dentist appointments on Saturday. The girls (11 & 9) no longer have any issues -- I just send them back. Luke on the other hand has lots of issues due to his autism and issues due to his cleft lip/palate. Our dentist is great. Luke is on my lap, head on the dentist's, the hygentists holds his hands/arms. The the dentist just quickly gets the job done. This time we get to talk about starting ortho in antisipation of his bone graft and the fact that two of his bottom teeth are coming in behind the baby teeth and the baby teeth aren't even wiggling. I see dental surgery in our near future. There are also two top teeth that are in the gum cleft areas that we don't know if they are baby or adult teeth. YES this is one thing about parenting I finally get. First its the tooth fairy, dentist, orthodontist and finally wisdom teeth. I laugh now when young parents are SO excited for the first tooth coming in. HA you don't know what those teeth really mean! Although we have the nicest dentist in the world and now his son too. I also LOVE my hygentist. Its so diffeent than when I was a kid and hated it. My sons really have grown up not scared and don't even mind any more. At 18 they have zero cavaties, lord knows how many I had by then!! I have never been a huge fan of the dentist. As I was at the dentist when I got the phone call about Jer being half-blown up by a land mine, my last visit did not change my opinion any. Connor, surprisingly, is not that freaked out by the dentist. You would think a kid with major oral aversion issues would hate the dentist, but he doesn't seem to have a big problem with it. Of course, he used to be fine with haricuts too, and now he wiggles all over the place. He'll be due for another dentist appointment soon. I may have just doomed myself. Glad to know you and the kids have some clean chompers! Thankfully, we now have the greatest dentist ever. Besides my autistic son, I have one who's crazy mouth/head sensitive plus a melodramatic daughter who simply can't bear to do the fluoride rinse. Our dentist had an autistic son herself, and she gave me a whole protocol to do before I ever brought the boys in- buy a set of pick and mirror (yes, you can get them at the drug store) and do some gradual desensitization for a month before hand. You start with touching the back of the hand briefly, etc., and do whatever your kid can. Then, she does everything herself, meets the kid first in the waiting room, and does multi-sensory work including DVD as reward for good behavior, noise-blocking headphones, vibration toys, etc. She just gets it. She has saved my sanity. Isaiah's dentist specializes in children with special needs. He's been very patient with me and my kazillion concerns about Isaiah's very peculiar set of chompers. My dentist always offers me mint, orange or cinnamon toothpaste. Mint is too strong for me, so I am glad I get the choice. Too bad yours doesn't offer flavors. I haven't been to the dentist with Emily yet and I am dreading it! Just brushing her teeth can turn into a wrestling match, so I can only imagine what she would do at the dentist! She doesn't hate teeth brushing. She likes the toothpaste. She gets so excited that she wiggles all over the place. That makes things a little tricky for me. Thank goodness I have a friend whose a dentist. She's promised laughing gas if Charlie can't handle the stress. Frankly, I'm more scared that Charlie will bite her--but surely she's used to things like that????? I'll let you know how it goes! Katy, that is BRILLIANT: I am getting laughing gas next time! And then I won't get upset when Max wigs out! You are so wise. Michelle at Knowledge Safari: No character toothbrush for me. Come to think of it, no toothbrush whatsoever. Maybe dentist cutting back this year?! ELR: NOT FAIR! I want flavors. 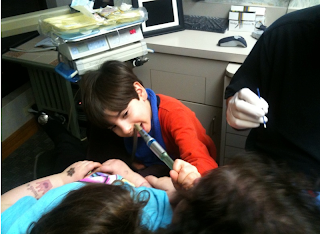 We're to the point where we do anesthesia dentistry with Teddy. No dentist would touch him since he's getting so big & strong & he grabs the polisher out of their hands--they're too worried about what he'd do with a drill! We tried laughing gas, but it didn't do a thing for him. I was really scared the first time we did the anesthesia, since he can really freak out when he comes out of it. But he did great! We've been to the dentist twice and both were disasters. I'm going to try one who specializes in special needs kids next. But still dreading it. I always thought that sedation would be the easier step, but after 2 failed IV attempts in our ER visit in December, I'm going to avoid that like the plague. So glad your visit went well enough to see his teeth! Yay! its really very nice posting thanks for sharing this with us. its so nice and informative and helpful for us.